TURQUIE – Patara - A bronze Hermes statue from the Roman era, which has been unearthed during excavations in the ancient city of Patara in the southern province of Antalya’s Kaş district and restored at the Antalya Museum, was yesterday introduced to Culture and Tourism Minister Ertuğrul Günay. 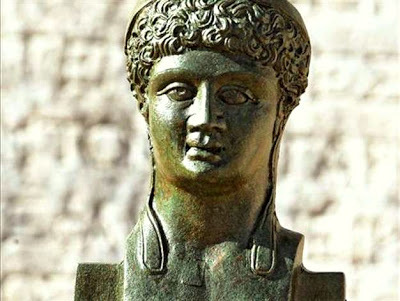 The head of the excavations, Professor Havva İşkan Işık, said the four-meter long head statue was unique in Turkey and the world, saying, “we have never found such a stature before.” Işık said the statue was estimated to date back to the period of Emperor Constantine. “This is a work from the late period, which makes it more special,” he said. 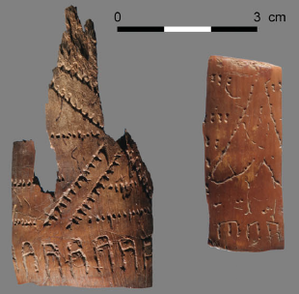 RUSSIE – Yana RHS - A late 2012 article in the journal Antiquity featured the well preserved and extensive bone and ivory artifacts recovered from the Yana Rhinoceros Horn Sites, six 28,000 year old sites located above the Arctic Circle in far eastern Siberia. Yana RHS is important for a number of reasons, not the least is its age and location, east of the Verkhoyansk Range in Siberia, and thus close enough in time and space to be a candidate site for the initial colonists of the Americas. PALESTINE – Gaza - The Palestinian naval police have found several ancient archaeological artefacts in the depth of the Mediterranean Sea off the Gaza coast, a spokesman for the Palestinian police in Gaza announced on Wednesday. Spokesman, Ayman al-Batneeji, told a press conference at the fishing port in Gaza: "The floating force of the naval police pulled out a group of rare archaeological relics, including poles and baked clay, dating back thousands of years." Al-Batneeji praised the efforts of the Palestinian naval police which carried out the excavation in addition to its primary duties which are the protection and care of fishermen. "This is not the first time that the naval police have pulled out archaeological pieces from the sea," Al-Batneeji said. "Two years ago, they extracted another group of artefacts which also belonged to ages long past." In response to a question about the Palestinian naval police's capabilities with regard to possible future excavations, Al-Batneeji said: "We are prepared for this, but the shortage of appropriate tools and skills hinder our work." He said that the naval police exert much effort in carrying out such missions. Al-Batneeji encouraged the naval police to continue its efforts in excavating the Gaza coast and searching out more archaeological pieces, particularly in the shipwreck close to the Gaza beach. 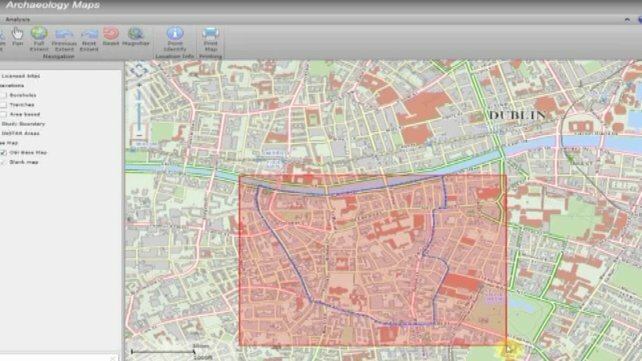 IRLANDE – Dublin - An online record of archaeological finds in Dublin is being prepared as part of the city council's new heritage plan. It will use online mapping technology to show details and locations of 40 years of digs in the city. Dublin City Council archaeologist Ruth Johnson says it will also be valuable for planners and developers. Despite the cut in funding for conservation the council heritage officer Charles Duggan says conservation will continue. Two town houses in Henrietta St are currently being restored, - the street is almost completely intact since the 18th century. However, Ian Lumley of An Taisce say there are over 100 historic buildings in Dublin such as Aldborough House in the north inner city that are in private hands and at risk. He says the council needs to use more enforcement and work with banks and property owners to have them secured. Dublin City Council says enforcement action will continue and its priortiy is finding modern uses for such buildings. It says its heritage plan will be ready in April. USA – Cumberland island - High seas and pounding surf have revealed a piece of the past at Cumberland Island National Seashore in Georgia, where a shipwreck thought to date to the mid-1800s has surfaced. Whether the remains are those of a freighter hauling corn, tobacco or cotton, or maybe a blockade runner with Civil War ties, is not yet known, and might never be. Seashore officials say the remains depict a craft roughly 80 feet long. Unfortunately, there are few clues as to the ship's provenance. "This is only a section of the boat and is not the full craft. Due to the broken nature of the wreck, archaeologists are unable to determine the function. However, based on the boat’s construction, it is believed that it was built in the mid-19th century," read a release from the Seashore. 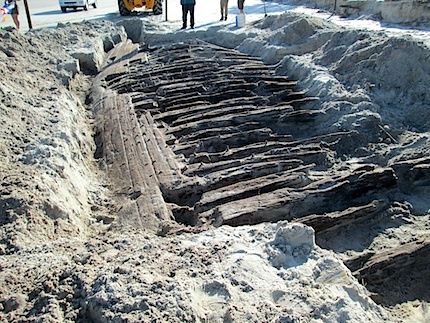 "The two most prominent features uncovered are the 30+ ribs and approximately 10 pieces of the outer shell planking. The wooden timbers are fastened together by pegs or treenails." So far archaeologists have been unable to identify the wood used in the construction, but hope they'll be able to both identify the wood and date it from samples they took. That information could help them narrow down the date of the shipwreck. Somewhat interestingly, while the Seashore was designated back in 1972, this is the first wreck discovered on its shores since then. Still, "historical records document several shipwrecks off Cumberland Island," the Seashore notes. "However, due to the lack of artifacts and identifying information associated with this piece of shipwreck, archaeologists are unable to determine the shipwreck’s name, origin, or type of ship." 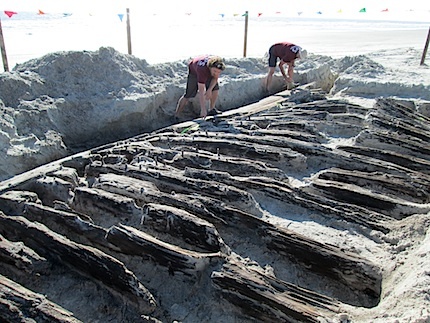 After excavating part of shipwreck so they could take measurements and photographs, archaeologists buried the wreck again in the sand for its protection, the release noted, adding that "this is a common practice for protecting shipwrecks along the Atlantic barrier island coast. Wooden objects which have been submerged in a marine environment will quickly deteriorate once exposed to the air."